On Tuesday, October 25, 2016, at approximately 12:00 p.m., Transit Policing deputies responded to the Vermont Metro Green Line Station, located in the 11600 block of south Vermont Avenue, Los Angeles, to investigate a felony vandalism which occurred inside the station. The suspect allegedly smashed a Metro information case, valued at several thousand dollars, with a baseball bat and fleeing the location, possibly on a train. Witnesses told the responding deputies the suspect swung the bat at patrons, which was confirmed during a review of the station Closed Circuit Television recording. The suspect was described as a male adult, of Black or Hispanic descent, with a bat; this information was broadcast by handheld radio to other units in the area. 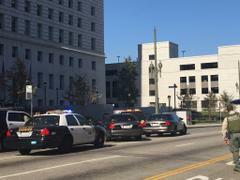 At approximately 1:15 p.m., Sheriff’s County Services Bureau personnel saw a man matching the suspect’s description in front of the Hall of Justice, 211 West Temple Street, Los Angeles. When deputies approached, the suspect became agitated and began pacing back and forth holding the bat in his hand, while wearing a large backpack. Fearing for the suspects and the public’s safety, deputies closed portions of Spring Street and Temple Street, and set a safety perimeter. Mental Evaluation Team (MET) Deputies from the Transit Policing Division, and Sheriff’s Crisis Negotiators Team (CNT) deputies began to speak with the suspect, in an attempt to work toward a peaceful resolution. After several hours of negotiating with the suspect, Special Enforcement Bureau (SEB) personnel responded. With the aid of on scene personnel, SEB personnel took the suspect into custody without incident. The suspect was arrested and booked at the Los Angeles County Sheriff’s Department Inmate Reception Center for Felony Vandalism 549(A)(4)PC, and will be held in lieu of $25,000 bail. The investigation into this incident is ongoing and additional charges may be pending. 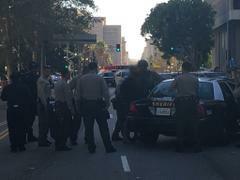 The Los Angeles County Sheriff’s Department would like to thank all the responding personnel and agencies that assisted with various parts of this incident to include traffic and crowd control. If you believe you have information about this case, please call the Los Angeles County Sheriff’s Department Transit Policing Division Detectives at (888) 950-SAFE (7233).